Then you get it home and no matter how you try it, you just can’t make that furniture fit in the space of your new home! What to do? Plan ahead (duh!) or work a plan with what you already have. Measure each room. Don’t just measure once—measure twice. Write it down. Measure the spaces from the corners to the windows and doors. Write it down. Measure the width of each window and door. Write it down. Sketch out a simple floor plan with your measurements. You will use your simple floor plan to create a more sophisticated one using a free online floor plan tool like this one at Room Sketcher or any of the tools located Room Sketcher and several other floor plan tools allow you to design in two dimensions and then view in 3D to get a better idea how it will look. It’s very important to include windows and doors in your plans. And don’t forget to locate heating and air conditioning vents and returns, power outlets, light switches and cable and Internet connections. If you already have furniture that you are trying to fit, measure its length, width and height and any clearance it might need—such as the footrest to a recliner or the doors to a television cabinet. This is especially true if parts of the furniture extend even slightly beyond the footprint. Choose the nearest approximation from the floor plan tools to include in your layout. When you’re done, you’ll be able to rearrange your furniture virtually, without breaking your back, to see if it will fit. If you find the online tools difficult, go old school with a diorama. Create rooms from cardboard boxes and cut in doors and windows. Create furniture to scale from pieces of cardboard or stiff paper. 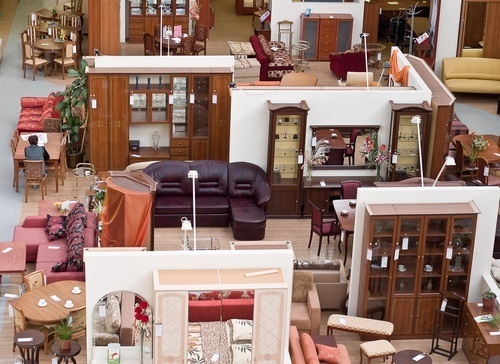 You can rearrange these as many times as you need to quickly see if your furniture will fit. Or, grab some grid paper and a ruler and draw out your rooms and then furniture from the “top view.” While this method only offers a 2D view, it is quick and easy. If you want specific instructions, check out this guide from Decorating Studio’s archives. If none of these ways seems helpful to you, make a trip to your favorite furniture store (with your measurements in hand) and get a room designer to help you. Along the way, they’ll be able to show you which furniture in their showroom will work for your situation. If you’re looking for a home to fit your furniture, we can help. Show us your style and let us know the sizes of your favorite pieces and we’ll track down just the right home for your beloved sofa or heirloom armoire.